Winter Skin is an award-winning daily gradual tanning moisturiser for face and body. This daily nourisher builds over several applications into a beautiful natural honey glow. Nothing says healthy skin better than a lovely soft glow, but this can be difficult to achieve without risking premature ageing and almost impossible to achieve during the UK’s winter months. 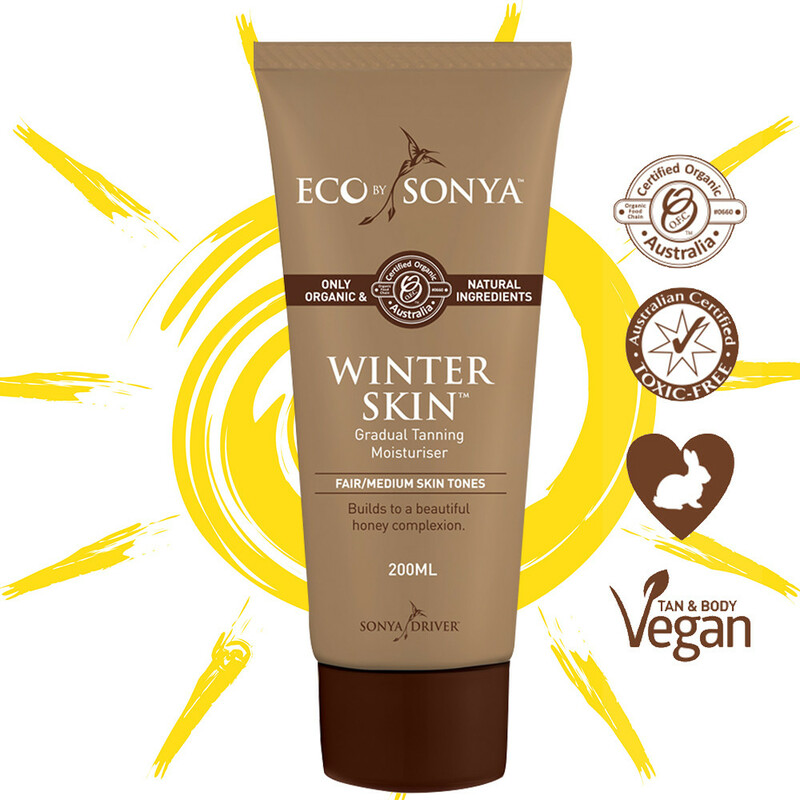 Apply Eco by Sonya Winter Skin as you would a moisturiser to build a stunningly natural tan. This nourishing lotion is subtle, leaving no sticky residue, and is created using a blend of 100% certified organic ingredients, including nourishing Aloe Vera, Grape Seed Extract, Cacao, and softly scented Rose Geranium. It is also free from artificial fragrances, synthetic orange dyes, parabens & GMOs – zero harmful chemicals or toxins. Skin Type: Perfect for fair to medium skin tones. Application: Apply tan liberally to clean, dry skin, massaging thoroughly and evenly in a circular motion. Take your time and ensure to cover all areas but avoid applying to heels. Wash hands thoroughly after application and allow tan to dry completely before getting dressed or hopping into bed. For best results allow tan to develop for at least 8-hours before showering and shave and exfoliate at least 24 hours prior to application. Use as a full body moisturiser. Tip: To master the application to your face, hands and feet, use any product left on your hands after applying to limbs, this helps eliminate the chances of an uneven application. Matching Products: Use Eco by Sonya Extreme Exfoliant Glove prior to application and Eco By Sonya Coconut Body Milk as a moisturiser after application to achieve long-lasting results.